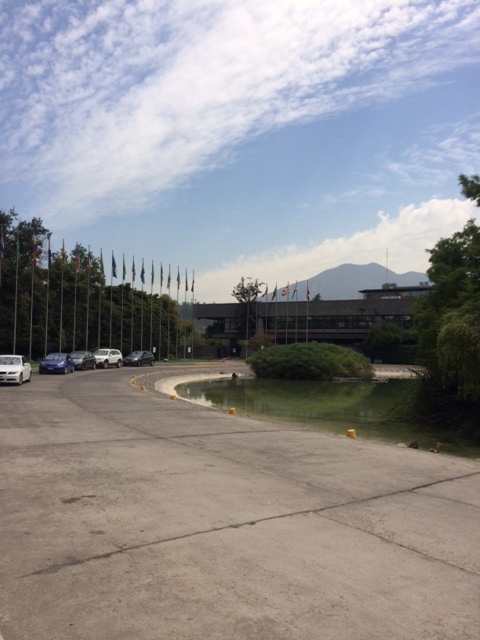 During my visit to Chile I had the opportunity to meet and greet in three offices of the UN Regional Economic Commission for Latin America and the Caribbean. 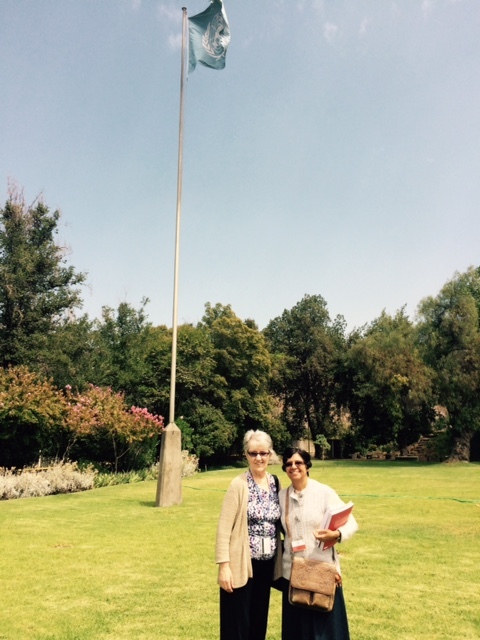 This visit was pre-arranged by our NGO Regional Designate to CEPAL (Spanish for ECLAC) Marta Iris. 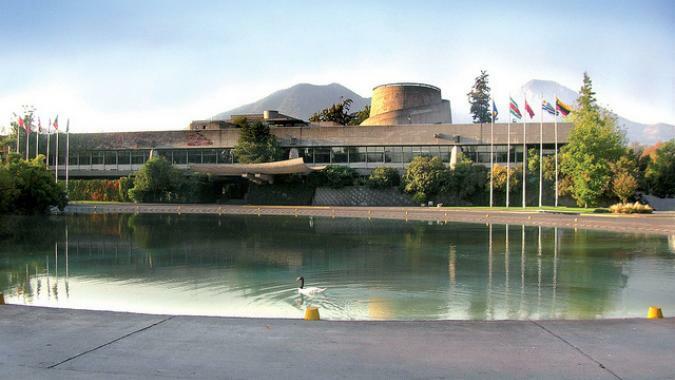 The Commission building is set in lovely gardens with the Andes in the background and a lake in front of the building. Much administrative work is done from the Commission. All was quiet as meetings were not in progress. The Commission was established in 1948. In 1984 the countries of the Caribbean were included. CEPAL has 44 member states – 20 in Latin America, 13 in the Caribbean and 11 outside the region. Canada, France, Germany, Italy, Japan, Netherlands, Portugal, Republic of Korea, Spain. United Kingdom of Great Britain and Northern Ireland, and United States. We visited the office of Gender Affairs and the office of Population and Development. 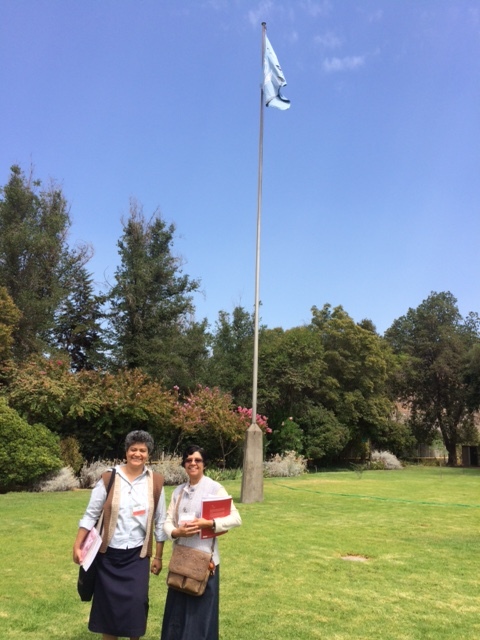 Ms. Jimena Arias Feijoo, was the Social Affairs Officer who graciously greeted us and generously gave of her time. She shared many publication with us and alerted us to the new website of the Commission. It is bright, easily followed and informative and is in Spanish and English. Commission website Spanish is the working language of the Commission. Mr. Paulo Saad spoke with us at the office of Population and Development. In both offices we spoke about the importance of the new Post 2015 development agenda that is currently being negotiated in New York. There will be a regional meeting of the Commission on Population and Development in Mexico later in the year. 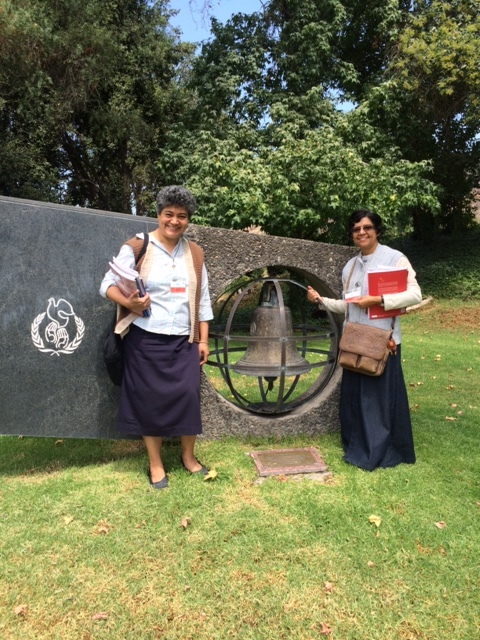 Marta will follow up and hopefully sisters and mission partners will be able to participate from Mexico. 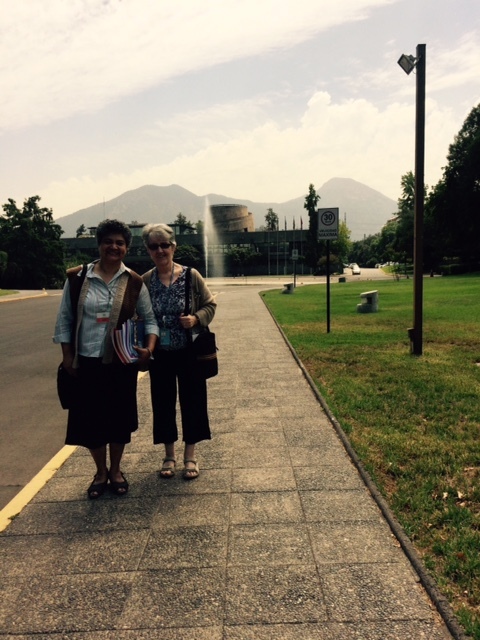 Maria Jose Correia from Brazil accompanied Marta and I to CEPAL. Following our visit we had coffee and took photographs. 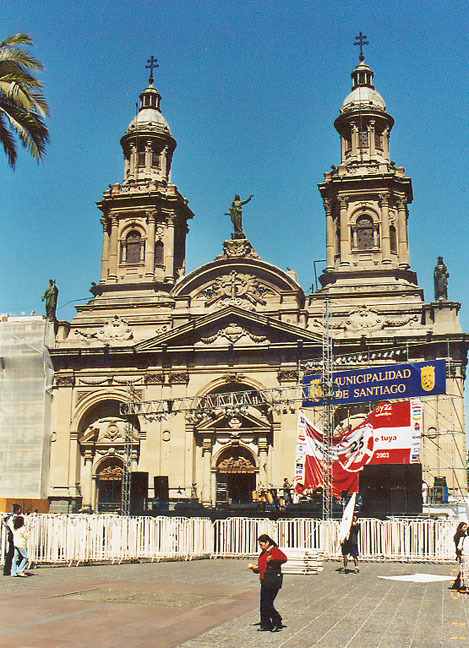 In the afternoon we spent some time in the Plaza de Armas ~ Santiago Chile and visited the Cathedral Metropolitana. 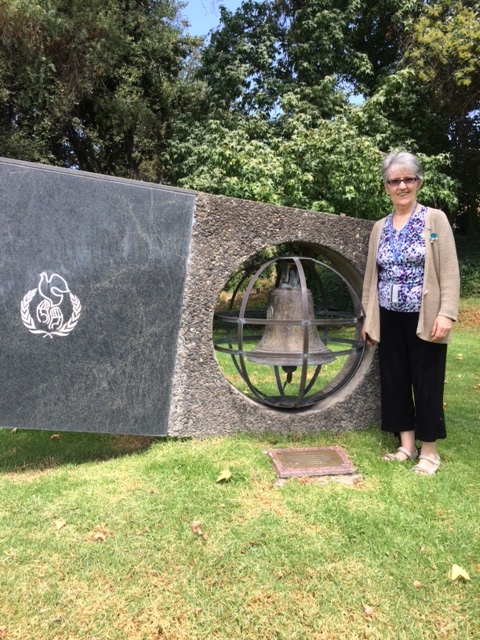 The commemoration plaque and bell honor Oscar Aries Sanchez – President of Costa Rica – who won the nobel peace prize in 1987 for his work for peace in Central America. 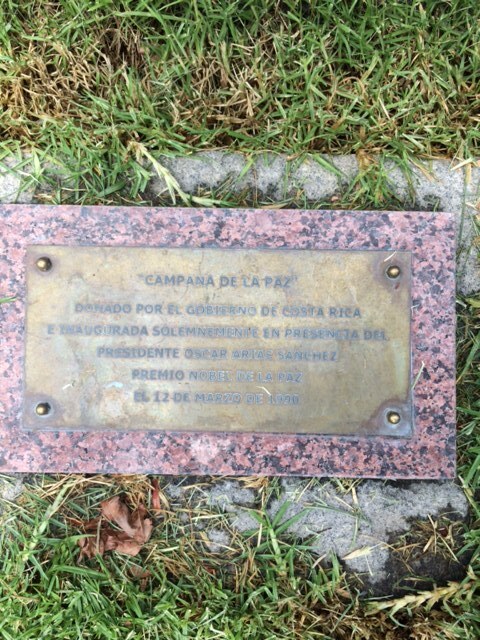 This entry was posted in CEPAL, UN Regional Commissions. And the linkage, regional to International..
I’m sure it allows for greater contextualizing of the mission as advocacy and policy are done on behalf of GS ministries in Latin America-Caribbean..
Keep up the good work. Always happy hear about it and see a picture.